Beautiful artisan linen aprons and canvas food carriers handcrafted in Portland, Oregon. Free delivery in US. The Grace Apron has a flair for fashion and blurs the line between where your clothing ends and your apron begins. You know that moment when the doorbell rings before your dinner party and you’re standing there wearing an apron that says “Kiss the Cook?” That apron. So you take it off to greet your guests. Then, as everyone congregates in the kitchen, you add the finishing touches to your dinner but not before splattering all over your gorgeous outfit. We’ve lived that scenario too many times. That’s what drove us to create the Grace Apron. As a chef and a designer duo, we wanted something beautiful and functional - something that protected our clothes too. We love cooking and creating - and we want to feel and look good while we’re at it. 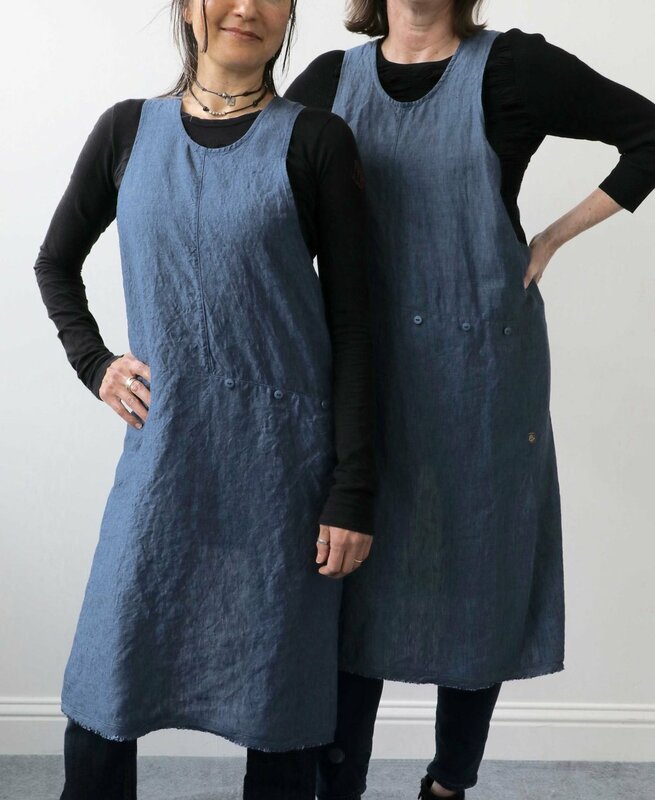 Designed to become an indispensable part of your culinary and creative adventures, the Grace Apron is made of 100% linen, meant to skim and complement your outfit comfortably while adding functional details such as height and width adjustability, a hidden pocket, and a button-on hand towel we call a Flounce. In fashion-speak, a flounce is a piece of fabric trim that’s pleated and attached to a garment along one edge. In our world, it’s a detachable hand towel that keeps your apron from getting wet and messy. Wipes your hands on the flounce instead of your apron. Unbutton it and throw it in the wash, while your apron is still looking good. A Flounce is included with each apron purchase, but you might want to pick up a spare or two, so that you always have a clean one ready. We started off with a one size apron that fit most bodies. Since the crossback straps offer ways to make adjustments for height and width, we thought we had everyone covered. Then we learned that some customers were too covered, so now we offer a Petite size. It is 3 inches shorter in hem, with shorter straps. Ideal for apronistas that are 5'4" height and shorter, with slim build. When you are picking your apron color, you’ll be asked to select Regular or Petite size. (The model on the left is 5’2” tall. She is wearing our Petite apron.